“The Land Of Thunder Dragon” – as it is rightly called, Bhutan is a little Himalayan hamlet that has gained the title to be the “Happiest Country”. And you shall feel the vibes of happiness all around you – as soon as you’ll entire Bhutan. With lofty Himalayan mountains, gusty rivulets crossing the valleys, the aroma of Momos and Datshi in the air, colorful prayer flags and huge Dzongs – Bhutan can never fail to mesmerize the visitors. This 7 – days road trip through the towns and countrysides of Bhutan will let to see the country’s diverse sides. Witness the popular Tsechu Festival, visit the numerous old forts and hike up to one of the highest monasteries in the world – and you shall return back home, being a lot more happier! Make sure you reach Bagdogra Airport before 12 PM. The trip will start the next day at Phuentsholing – Immigration Office – 9:00 am, 18th Sep 2018. Phuntsholing, the second largest town in Bhutan is where your adventure with us begins. We personally think of this town as the gateway to travel heaven because every traveller stops here to enter this beautiful country. The clean air, greenery and mountain tops serve as a first glimpse of your travel destination. We begin by completing all immigration formalities and baggage checks and then set off on our journey to Thimphu. En-route we will stop at Chhuzom which is the confluence point of the Thimpu and Paro river. “Chhu” means river and “zom” means join and the Bhutanese consider it as the confluence of the mother and father river. The sight of clear blue waters combining while 3 different styles of “stupas” or shrines overlook the river is a pleasurable start to the day. As we arrive at Thimphu, you will check-in to the hotel, freshen up after all that travel and get ready for an evening walk. As evening comes, we stroll through Thimphu Main street and the market area. As you walk around the city, you’ll notice that it comprises of a mix of modern and ancient tradition, making it special in its own way. We’ll stay the night at Thimpu with eager anticipation of the adventures that tomorrow holds. One of the most important and largely celebrated festivals of Bhutan is called the Thimphu Tshechu and we will witness it live in all its greatness. Held in the capital city each year, this 3 day festival attracts thousands of people, many of whom travel from neighbouring “Dzongkhags” or districts to witness attend the festivities. Prior to the start of Thimphu Tshechu, many days and nights are spent praying and conducting rituals to invoke the gods. The festival theme underwent a pleasant change in the 1950’s when the then king introduced diverse “Boed chhams” or masked performance by lay monks to the festive performances. These new additions brought with it more colour and diversity to the Tshechu. For example the masked dances of Guru Tshengye (Eight Manifestations of the Guru) and Shaw Shachi (Dance of the Stags) were similar to stage theatre. Similarly, the dancing and jesting of the Atsaras who are referred to as the dupthobs (acharyas) are believed to entrance evil forces and prevent them from causing harm during the festival. Modern Atsaras also perform short skits to disseminate health and social awareness messages. After a day full of culture, dance and diversity we head back to the hotel and get a good night’s sleep because tomorrow brings with it a new destination! After a good breakfast, we will move ahead in our journey by driving to Punakha through the Dochula Pass. Look out the window and witness perfect panoramic views of the Himalayan mountain ranges that will take your breath away. Perched at an elevation of 3,100 metres, the Dochula Pass is a mountain pass that is surrounded by the snow-capped Himalayan mountains. Dochula Pass holds within it 108 memorial chortens or stupas build by Ashi Dorji Wangmo Wangchuk, the eldest Queen Mother. The pass is also home to a monastery called the Druk Wangyal Lhakhang (temple) which was built in honour of the 4th king of Bhutan. The past and future appear to merge in the details of the temple that tells the story of a supreme warrior figure whose vision pierces the distant future. Next Stop: Lobesa Village. What’s so special about this village is that it holds within it the Chimi Lhakhang Monastery also known as the Divine Madman’s Monastery. This monastery is famously known as the fertility shrine and women pilgrims come here seeking blessings to beget children. It derives its name based on the unorthodox teaching methods of a saint called Drukpa Kunley who built a chorten on the site. We will then head to what is considered to be the most beautiful Dzongs amonst Bhutan’s 21 Dzongs ) – Punakha Dzong. The Punakha Dzong is strategically located at the confluence of the Mo Chu and Pho Chu Rivers and is one of the most majestic structures of Bhutan. All of Bhutan’s kings were crowned here and it is still the winter residence of the official monk body. In spring time, the lilac-coloured jacaranda trees that encompass the dzong make it a place of true scenic beauty. We will stay overnight at Punakha. This occasion for merriment and revelry is attended by the people of Thimphu and Punakha. Originally held in the Wangdiphodrang Dzong , this festival now takes place at Tencholing Army ground due to the a fire in the dzong. During the 3 days, there are masked performances and folk dances. One the last day, a huge “thangka” or a Tibetan Buddhist painting is displayed for public veneration. This cultural festival is one of the biggest in Bhutan. Our next stop is the Phobjikha or Gangtey valley. From the small hilltop overlooking Gangtey Goemba, we will head downhill through flower meadows to Semchubara village and from here through beautiful forests and into the open valley. The trail ends with a community school and a15th century Buddhist temple called Khewa Lhakhang which features three two-storey statues of the past, present and future Buddhas. At the valley we will visit the Gangteng Monastery. The monastery is one of the main seats of the religious tradition based on Pema Lingpa’s revelations and one of the two main centres of the Nyingmapa school of Buddhism in the country. During winter, black-necked cranes visit central Bhutan to roost, circling the monastery three times on arrival and repeating the same when returning to Tibet. We will stay the night at this culturally rich valley. Apart from it being home to the sole international airport in Bhutan, Paro Airport, Paro is a historic town with about 155 temples and monasteries. Rinpung Dzong a fortress-monastery overlooking the valley, houses within it a collection of sacred masks and costumes. The national museum, Ta Dzong, is also set in Paro. Hence, Paro preserves the rich cultural traditions of the country. The last day of our wonderful Bhutanese backpacking trip starts with an early morning excursion to the most breath taking spot in Bhutan. The Taktsang Monastery or the Tiger’s Nest perched majestically on a cliff which is 2,950m above sea level, defies all engineering logic. The energetic can take a two hour hike up to the cliff or a pony ride can be arranged at an additional cost. We will also visit the one of the oldest temples in Bhutan called Kyichu Lhakang and interact with the locals at a farmhouse. The evening will be spent exploring the outskirts of the town of Paro together. After a long and satisfying last day, we will spend our last night in Paro. Wake up, get ready and grab some breakfast before we depart to Phuntsholinga and make our way back home. Experience a soul-satisfying trek up to a rustic monastery perched on the edge of a cliff. Feel alive as you witness the traditional song and dance of Bhutan’s biggest cultural festival. Let nature’s brilliance astound you as you see two magnificent rivers converge into one. Admire the countless heritage spots that make Bhutan famous for its unique culture. 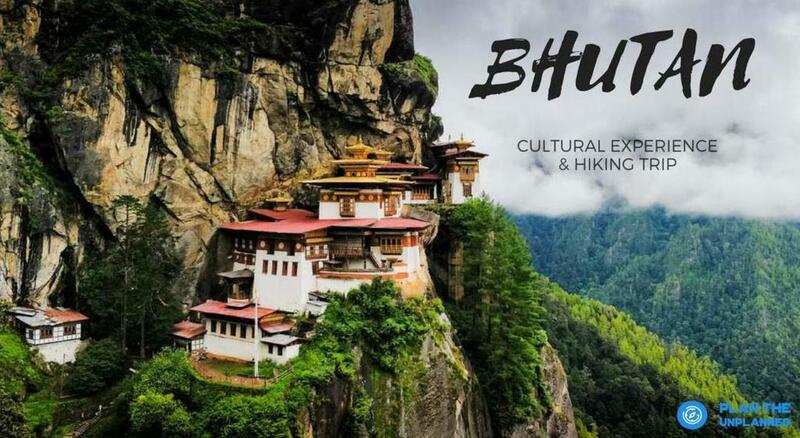 Whether you love photography, want to embark on an exciting new trek or are drawn towards places that boast of rich cultural diversity, Bhutan is bound to mesmerize you with a perfect blend of scenic landscapes, majestic monasteries, and terrific trek locales. For pick up and drop from India (Bagdogra/Siliguri) charges will be extra. You may book your return ticket for 26th Sep 2018. There are a lot of ways to reach Bhutan. But the best way what we would recommend it, take a flight till Bagdogra and from there take a cab/bus till Phuentsholing/Jaigaon. Also, you can take a flight directly to Paro. The permits can be taken care in Paro itself. 10,000/- INR (Booking Fee) is not refundable. If you cancel the plan after 1st August – No Refund.